Welcome back! Today we're gonna take a quick peek at Carnival Toppers, the companion set to Carnival Cupcakes and also has a coordinating Creative Cuts set! 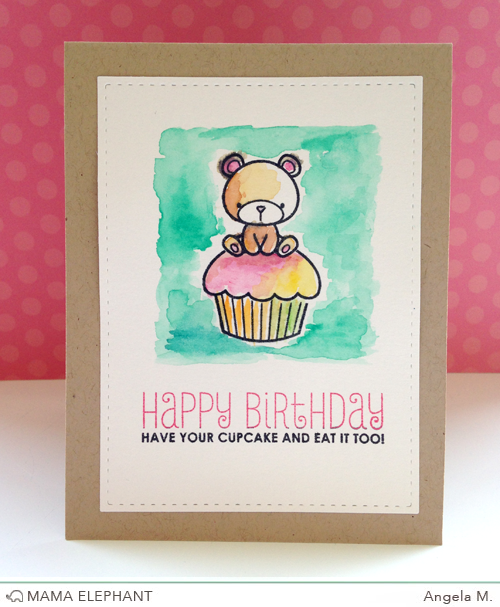 Filled with more delicious additions to your cupcakes, the sentiments, however are really the main stars of this set! Clever and cute! Now here's my card, I colored my cupcakes with Copic markers, took me a good while. But, I've discovered lately that my love for watercoloring somehow spilled into all my other coloring techniques -- this made coloring with Copics a lot more fun when you don't have to be perfect. i made sure to leave lots of uncolored, white spaces -- if you look carefully at the flower topper as well as the base of the cupcake. Everything was die cut and adhered with regular glue. Here is a card from Angela too! She's been on a water color frenzy! Those are the cutest sentiments! They make me giggle every time I see them! Oh Em Gee! Way too cute! Can't wait to see the full reveal!! These are so cute! I love the way you outlined the sentiment! I'm just dying of impatience to see the rest and the full sets! Eeeeeeeeee! !!!!!!! Yes, I am hungry for cupcakes! Thank you for making this set. I know I'm going to use it over and over again. Aww...these are such sweet cards!!! Love! So cute! The sentiments are sweet and a lovely font! Both cards are fabulous, and such a great tease! I can't wait to see more! These are so cute! Just darling. Very cute. Love those sentiments.